The French National Institute for Agricultural Research (INRA) is Europe’s top agricultural research institute and the world’s number two centre for the agricultural sciences. Being part of the Interest Group on Agricultural Data has been particularly fruitful in terms of strategic and technical advances to increase scientific data discoverability and interoperability at community level on Wheat Data for instance, or regarding semantic-based solutions for data handling and analyzing. Other RDA outputs are of importance for INRA, naming only those by the Libraries for Research Data IG which help defining the role of librarians from INRA in data management and sharing. 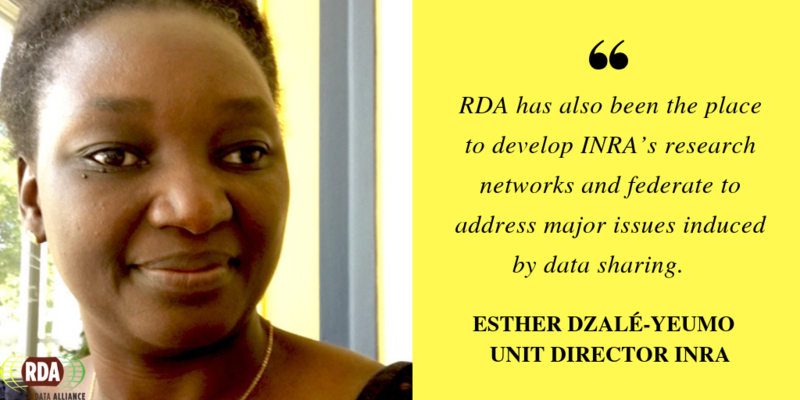 RDA has also been the place o develop INRA’s research networks and federate to address major issue induced by the data sharing. An adoption story written by Sophie Aubin, Michaël Alaux, Esther Dzalè, Odile Hologne and Cyril Pommier from INRA. Which RDA Outputs have been adopted? INRA has been involved in RDA since the very beginning as we attended the first plenary in March 2013 in Goteborg. Since then, INRA has identified RDA as an opportunity to contribute to the identification and/or construction of data standard. We have been consistently actively advocating for RDA and contributing to many working and interest groups, particularly the IGAD interest group, the Wheat Data Interoperability working group and the Agri-semantics working group. Beyond these, groups, INRA has been consistently monitoring and testing the outputs of many other groups of interest. 1. Wheat Data Interoperability Guidelines. It allowed to improve FAIRness in several working groups of the Wheat Initiative, projects and infrastructures, like many other stakeholders, adopted these recommendations. 2. Agrisemantics Working Group recommendations are being adopted or scheduled in future projects. This is needed to address some complex cases of data interoperability. To avoid effort duplication in (re)developing semantic resources for describing largely shared agricultural objects. Resources producers need incentives and tools to share their work. 3. The eROSA Roadmap for a pan-European e-Infrastructure for Open Science in Agricultural and Food Sciences (led by INRA) significantly reflects outputs of several RDA groups, including Data Fabric’s “Recommendations for Implementing a Virtual Layer for Management of the Complete Life Cycle of Scientific Data”. 4. “23 Things: Libraries for Research Data” by the Libraries for Research Data IG also inspired the INRA STI Department in developing data services for researchers. 5. The FAIRsharing Registry and Recommendations: As recommended by the FAIRsharing working group, INRA describe this resource in the FAIRsharing registry and linked it with existing resources. INRA did the same with the GNPIS repository which is domain specific repository. Also, contribute to AgroPortal with semantic resources that are further referred as standards in FAIRsharing. 6. The Data Citation of Evolving data: INRA recommends the implementation of the Data Citation working group by its databases and repositories. By adopting the three data standards included in the WDI recommendations have especially proven their importance and originality: MIAPPE, BrAPI and Crop Ontology. Those three standards already allow a consistent formatting of data for MIAPPE, their description with Crop Ontology and their machine enabled exchange with BrAPI. They have proven their usability not only for wheat but also for other crops as well as forest trees. The recommendations fit the needs of our organization and projects, and participants to the groups are already familiar with them when the adoption process starts. Persuading colleagues and partners to also adopt the WG outputs is also facilitated. We strongly recommend the same adoption. Indeed, to achieve a good level of interoperability at a global level, we believe that it is necessary to increase the number of adopters. It might be challenging and even intimidating to adopt some recommendations as a whole. Fortunately, a partial adoption is possible for most of the recommendations and is still better than nothing. 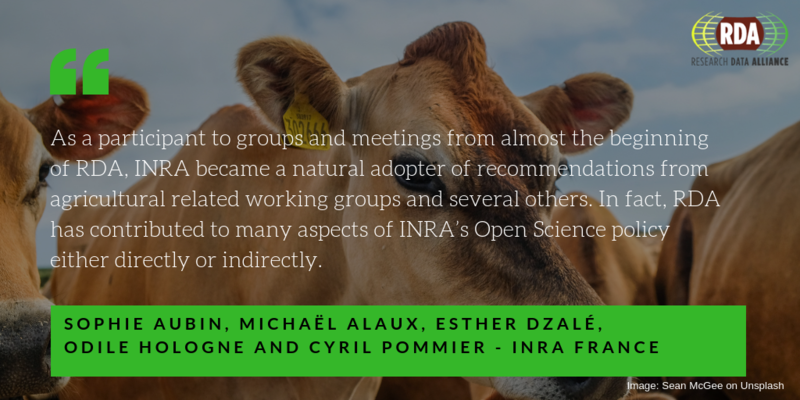 Read the full adoption story on INRA’s practical experience in implementing these outputs (refer to the PDF). Browse through all RDA outputs here, and find out which ones you could adopt to improve your data sharing. The Research Data Alliance (RDA) currently hosts over 60 Interest Groups and more than 30 Working Groups consisting of experts who are working on various topics related to (open) research data and innovation. These working groups produce the RDA outputs: the technical and social infrastructure solutions enabling data sharing, exchange, and interoperability. For you, to see how to implement the RDA outputs to improve the sharing, exchange and interoperability of your own data. We’ve asked RDA members who have already adopted RDA outputs, to share their experience and lessons learned in a story. Find here a series of RDA adoption stories by individuals, organisations and projects.